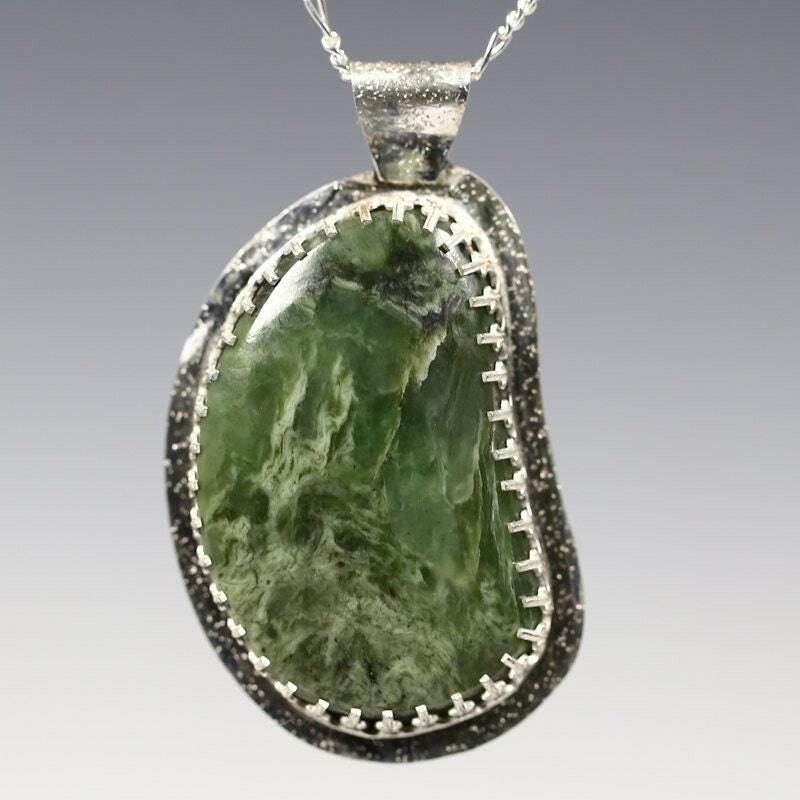 I made this pendant by bezel-setting a freeform-cut nephrite jade stone in a beautiful sterling silver gallery wire. Nephrite jade is one of the two forms of true jade (the other is jadeite). This jade is a medium green color with a pretty subtle pattern in lighter green. The shape reminds me of a big jelly bean. The stone measures about 40x25mm. The pendant measures about 2-1/8 inches (5.3cm) in length. I have imprinted a subtle texture onto the bail and the border of the pendant. This pendant comes with a sterling silver figaro chain measuring 17 inches (43cm) in length, and closes with a small sterling silver lobster clasp. All of the metal in the pendant and chain is solid sterling silver. Please note that clearance items are final sale. Birthstone Teardrop Pendant. Sterling Silver Necklace. Genuine Gemstone. Flush Setting. Natural Stone. Custom Jewelry. Gift for Her. Mother's Pendant / Grandmother's Pendant. 5 Birthstones. Teardrop. Sterling Silver Necklace. Genuine Gemstone. Custom Jewelry. Gift for Her. Sterling Silver Solitaire Ring. Genuine Gemstone. Tapered Bezel Setting. Hammered Texture. 5mm Faceted Round. Customized. Sterling Silver Solitaire Ring. Genuine Gemstone. Tapered Bezel Setting. Beveled Band. 6mm Faceted Round. Customized. Peridot Ring. Sterling Silver Solitaire Ring. Genuine Gemstone. Tapered Bezel Setting. Hammered Texture. 6mm Faceted Round. Customized.